Material: 100% Cotton, shrink resistant. A yukata (浴衣) is a Japanese garment, a casual summer kimono usually made of cotton or synthetic fabric, and unlined. Yukata are worn by men and women. Like other forms of traditional Japanese clothing, yukata are made with straight seams and wide sleeves. 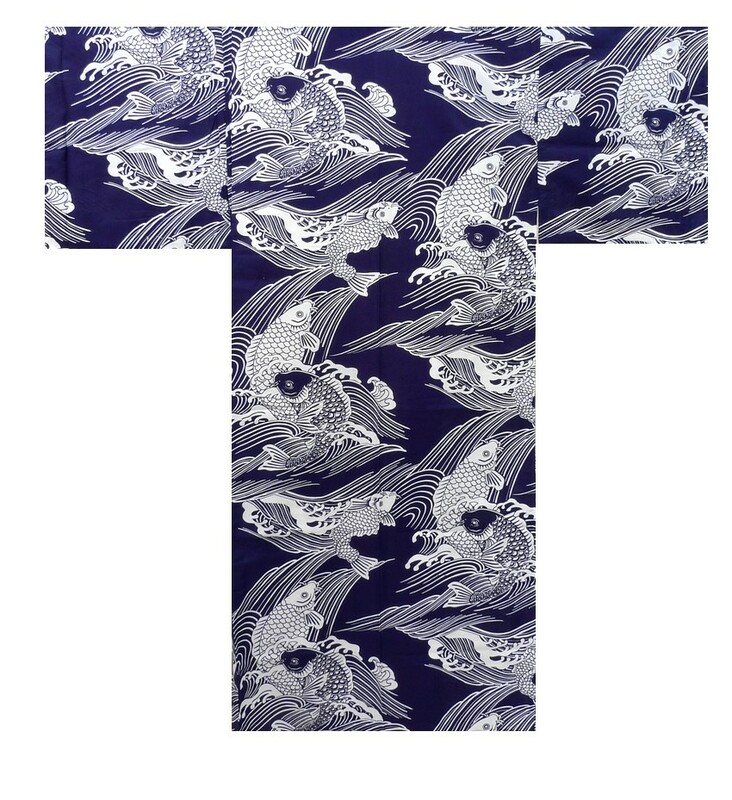 Men's yukata are distinguished by the shorter sleeve extension of approximately 10 cm from the armpit seam, compared to the longer 20 cm sleeve extension in women's yukata. A standard yukata ensemble consists of a cotton undergarment (juban), yukata, obi, bare feet, sandals (geta), a foldable or fixed hand fan, and a carry bag (kinchaku). Kinchaku are used by both men and women to carry cellphones and other small personal items. For men, an optional hat may also be worn to protect the head from the sun. Yukata literally means bath(ing) clothes, although their use is not limited to after-bath wear. Yukata are a common sight in Japan during the hot summer months. Traditionally yukata were mostly made of indigo-dyed cotton but today a wide variety of colours and designs are available. As with kimono, the general rule with yukata is that younger people wear bright, vivid colours and bold patterns, while older people wear dark, matured colours and dull patterns. A child may wear a multicoloured print and a young woman may wear a floral print, while an older woman would confine herself to a traditional dark blue with geometric patterns. Men in general may wear solid dark colors. Since the late 1990s, yukata have experienced a revival. Yukata are worn at outdoor summer events such as hanabi (fireworks) displays and bon-odori festivals. Yukata are also worn at Japanese inns ryokan after bathing.